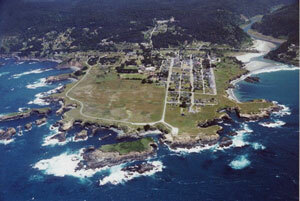 The town of Mendocino is located on the Mendocino Headlands along the Pacific Coast in Mendocino County, California. The Mendocino Headlands form a broad peninsula bounded by sea cliffs that range in height from 40 to 100 feet. Elevations along the eastern side of Mendocino increase to about 360 feet. The land slopes westward with a broad gentle ridgeline roughly bisecting the peninsula. The average annual precipitation is about 40 inches. Rain mostly falls from November through March. Precipitation usually declines during the late season and becomes minimal during the summer. Groundwater is the primary water supply for the town of Mendocino. Groundwater production in Mendocino for everyone is primarily from individual owned wells. Well depths usually range from 40 to 200 feet drilling into fractured bedrock, with flow rates ranging from less than 1 gallon per minute to over 25 gallons per minute. The terrace deposits act as a holding reservoir by storing water that recharges the underlying fractured bedrock. The distribution of the areas of saturated terrace deposits plays a key role in maintaining groundwater levels in the Mendocino Headlands aquifer. The physical setting is a key factor that influences groundwater flow. Groundwater flows from the highland areas of Mendocino towards the sea cliffs that surround the town where springs flow and trickle to the Pacific Ocean. Spring flow is also highly seasonal with the highest flow rates observed in the late winter and spring following significant rainfall. Unlike most California basins, the major portion of the annual inflow discharges out of the cliffs through springs rather than remaining in storage. With limited groundwater resources in the Mendocino Headlands have led to severe water shortages during the dry summer months for residents with marginal wells. In the past 25 years, several significant droughts have impacted the area. 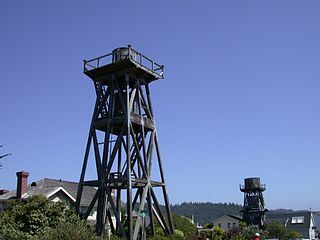 Most properties have storage tanks or also you will see around the village of Mendocino, water towers from the beginning of the settlement of the village of Mendocino. Some wells during drier years will run dry in the late fall months, and water is trucked in to replenish storage tanks or the water towers. Since 1990 the Mendocino City Community Services District adopted a Groundwater Management Plan with a groundwater withdrawal program, which limits groundwater extraction. The Groundwater Extraction Permit ordinance allows local government to mandate the amount of naturally occurring groundwater that can be withdrawn from the town’s aquifer on a sustained basis to help prevent depletion of the town’s aquifer on a sustained basis to help prevent depletion of the town’s groundwater by not exceeding the aquifer’s perennial or safe yield, which is the amount of water that can be pumped regularly and permanently without dangerous depletion of the storage reserve. Mendocino residents are acutely aware of the need for water conservation. The Department of Water Resources noted that Mendocino is already extremely conservative in its water use as compared with other north coast towns, with an estimated use of 70 gallons per day per capita on average. Conservative water use in Mendocino has helped extend existing town water supplies as far as possible. Gardeners are encouraged to cultivate drought tolerant plants. Visitors must be exhaustively reminded that in Mendocino we must conserve even on vacation. This entry was posted in Mendocino Interest and tagged aquifer, drought, drought tolerant plants, fractured bedrock, groundwater, groundwater extraction, Mendocino, Mendocino Headlands, Pacific coast, pennsula, severe water shortages, storage tanks, village of mendocino, watertower, watertowers.